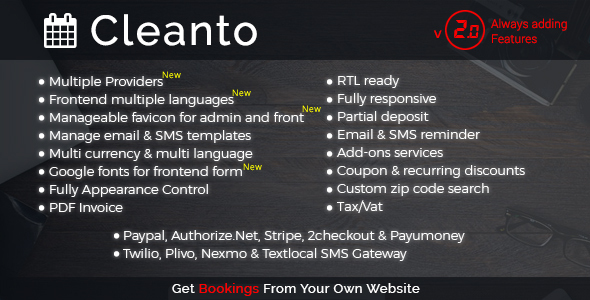 Cleanto is very powerful, flexible and advanced appointment booking system which can be used by multiple type of businesses. Its most fit for all type of cleaning businesses, janitorial, handyman services,domestic services, laundry services, carpet, windows cleaning, maid services, plumbing services and all type of maintenance & repair service provider companies to get bookings online without any hassles. its an automated online booking tool for local businesses having lots of features. its fully responsive and easy to use.